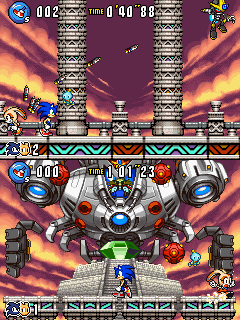 G-merl and Hyper Eggrobo (ハイパーエッグロボ Haipaaeggurobo) are the eighth bosses of Sonic Advance 3, and are the regular final bosses of the game unless the player collects all 7 Chaos Emeralds and the leader is Sonic. G-merl is the first boss the player will encounter, and will employ all the tactics of his previous fight in Cyber Track. He'll attack by dashing side-to-side, before warping into the air and dashing across the screen, unleashing a volley of missiles. He'll also move to the top-center of the screen and begin spinning, unleashing a spiral of missles that will hit the ground and the player if they are not careful. G-merl is fast and will take 4 hits as per usual (2 on Easy) to defeat before you can move on. 6 or less Emeralds/Have all 7 Emeralds, but leader not Sonic: Both Eggman and G-merl run away, but you hit Eggman's Eggmobile, G-merl jumps off the edge, and the game ends with the Master Emerald restoring the shattered world. 7 Emeralds with leader Sonic: Both Eggman and G-merl run away, but G-merl jumps off Eggman's Eggmobile, steals Sonic's Chaos Emeralds, and becomes his super form. He runs off, but Sonic uses the power of the Chaos Emeralds, and becomes Super Sonic. Eggman & Sonic team up, and the true final boss starts. This page was last edited on 18 March 2018, at 12:36.